As the polls started to close in Texas, cheers rang out for Beto O’Rourke but a group of Republican students and supporters of incumbent Sen. Ted Cruz remained unphased. Students of all political leanings gathered to watch the election results unfold and SE student Blake Giunta was among the crowd. 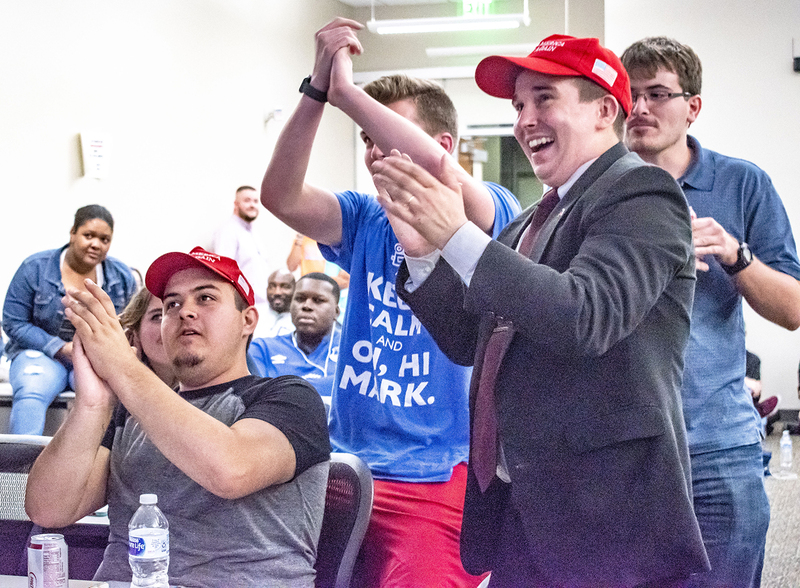 Sporting a “Make America Great Again” hat throughout the watch party, the SE College Republicans Club president said an O’Rourke victory wouldn’t make him “mad” as he believes in finding compromises in politics. “At the end of the day, I still live in Texas and I’m still a citizen, and I ask all my Republican brethren out there, all my right-wing friends out there, to just relax. It’s okay, guys,” Giunta said. 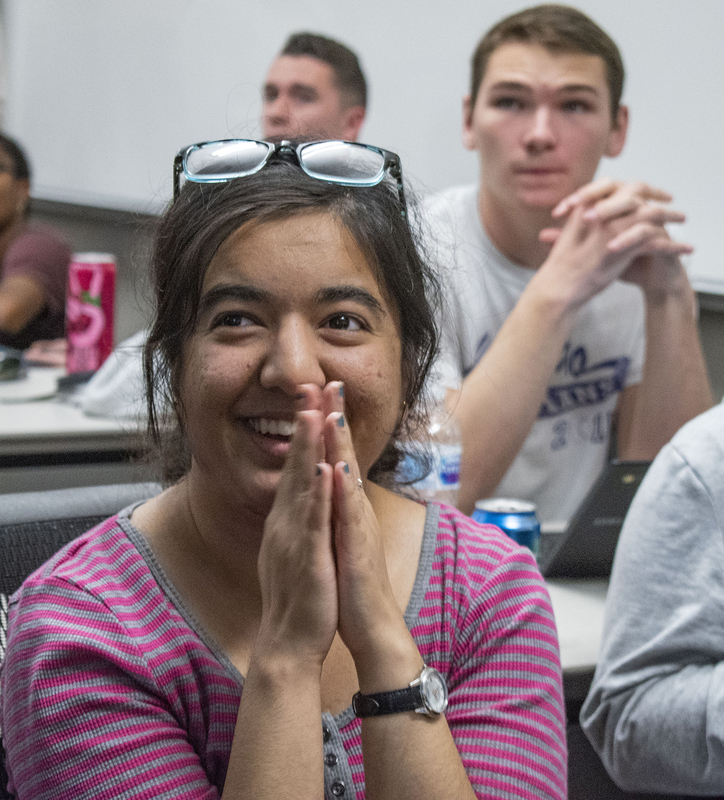 SE student Maryam Chowdry watches the 2018 midterm elections with anticipation as the results come up on the screen at an election watch party on SE. 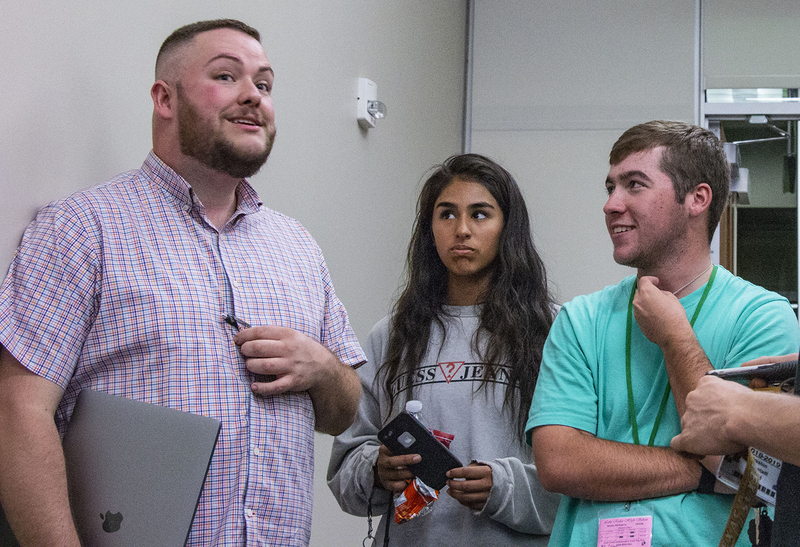 SE student Gared Lingle was interested in whether Republicans would maintain control but was also interested in the effect straight-ticket voting had on the election. SE student Michael Razmjookah attended the watch party along with his brother. A supporter of Cruz, Razmjookah was “worried” as the race remained close through the evening. “I didn’t expect it to be this close to be honest,” he said. 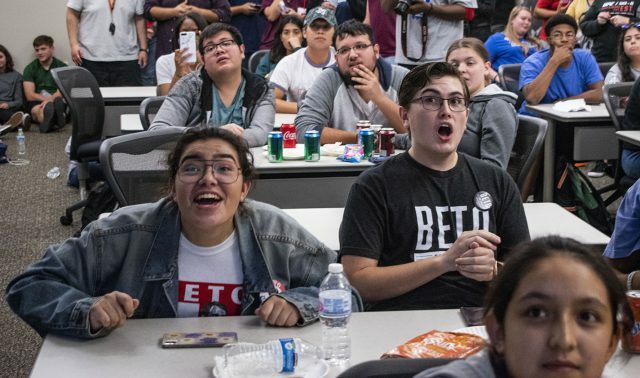 SE Organization of Latin America Club members react to polling data regarding the close U.S. Senate race involving Ted Cruz and Beto O’Rourke at the watch party. All eyes were on the Texas U.S. Senate race during a watch party at SE Campus. The room primarily consisted of students identifying as Democrats in support of Beto O’Rourke who ran against incumbent Republican Sen. Ted Cruz, who was eventually projected as the winner of the race an hour after the event concluded. SE student Citlalli Delangel heavily favored O’Rourke, she said, because she felt his views aligned the most with her own. Some of the participants of the watch party didn’t take a hard stance on either of the political parties, but rather rooted for the candidates who promised to get issues resolved like SE student Terry Vincent. “In the current state of this country you have to be more aware why you’re voting and who and what you’re voting for,” he said. SE students converse while election results come in during the Nov. 6 election watch party in ESCT 1207 on SE Campus. SE student Floradrian Joyner came out to the watch party due to her genuine interest in politics and because one of her teachers was helping host the watch party. If O’Rourke had won, Joyner would’ve wanted him to go into the new position with how immigration affects the African-American community in mind. Unlike the other students in the room, SE student Alassan Haddad wasn’t only focused on the races in Texas. He was also paying close attention to those in Florida and Georgia because history has shown those races to be up-in-the-air once the polls close. Alassan said he didn’t care who won the races but wants people to use this as a tool to come together and learn from each other. “For us in this country we need to learn how to help each other so we can progress as a country and get rid of the hate and have more positivity and love,” he said.